The Chatsworth 2 Tier Bird Bath with Solar Fountain makes a classically beautiful addition to any flower garden or yard. Constructed of a durable fiberglass-resin material with a faux stone finish, this bird bath holds about 2.5 gallons of water and includes a low voltage water pump with filter. The 2 tiers of water will attract dozens of your feathered friends while bringing elegance to your garden. Available in an Oiled Bronze Finish. Solar Fountains allow water to flow constantly through the basin from the hidden reservoir. 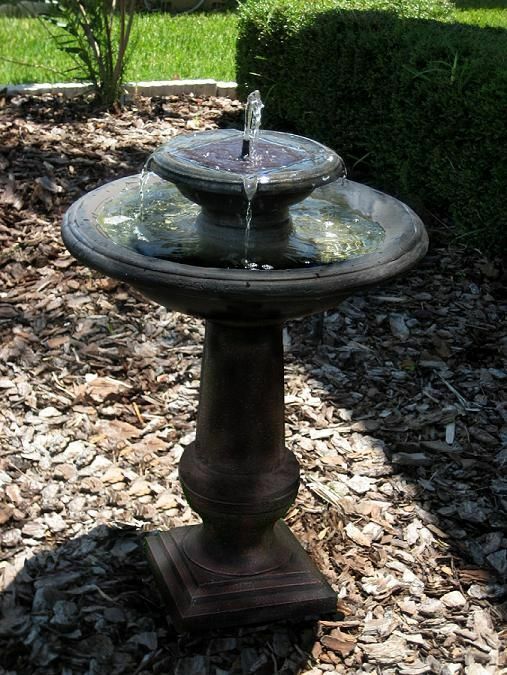 The Chatsworth 2 Tier Bird Bath with Solar Fountain is a perfect match for those hard to accessorize areas of your yard; no electricity is required. Solar Bird Baths do not require any wiring, so you will not have to tear up any of your gardens, lawns, or landscaping to install them. Thanks to the increasing popularity of solar birdbaths, there is a larger variety of designs and styles available. Pumps should never be run with a threat of freezing temperatures and should never be operated when dry or when water is frozen to avoid damaging the pump.